InterpretBank by Claudio Fantinuoli, one of the pioneers of terminology tools for conference interpreters (or CAI tools), already before the new release was full to the brim with useful functions and settings that hardly any other tool offers. It was already presented in one of the first articles of this blog, back in 2014. So now I was all the more curious to find out about the 4th generation, and I am happy to share my impressions in the following article. It took me 2 minutes to download and install the new InterpretBank and set my working languages (1 mother tongue plus 4 languages). My first impression is that the user interface looked quite familiar: language columns (still empty) and the familiar buttons to switch between edit, memorize and conference mode. The options menu lets you set display colours, row height and many other things. 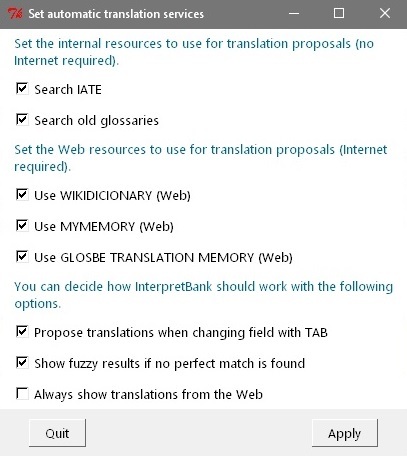 You can select the online sources for looking up terminology (linguee, IATE, LEO, DICT, Wordreference and Reverso) and definitions (Wikipedia, Collins, Dictionary.com) as well as set automatic translation services (search IATE/old glossaries, use different online translation memories like glosbe and others). Xlsx, docx and ibex (proprietary InterpretBank format) files can be imported easily, and unlike the former InterpretBank, I don’t have to change the display settings any more in order to have all my five languages displayed. Great improvement! Apart from the terms in five languages, you can import an additional “info” field and a link related to each language as well as a “bloc note”, which refers to the complete entry. All glossaries are saved on your Windows or Mac computer in a unique database. I haven’t tested the synchronization between desktop and laptop, which is done via Dropbox or any other shared folder. The online sharing function using a simple link worked perfectly fine for me. You just open a glossary, upload it to the secure InterpretBank server, get the link and send it to whomever you like, including yourself. On my Android phone, the plain two-language interface opened smoothly in Firefox. And although I always insist on having more than two languages in my term database, I would say that for mobile access, two languages are perfect, as consecutive interpreting usually happens between two languages back and forth and squeezing more than two languages onto a tiny smartphone screen might not be the easiest thing to do either. I don’t quite get the idea why I should share this link with colleagues, though. Usually you either have a shared glossary in the first place, with all members of the team editing it and making contributions, or everyone has separate glossaries and there is hardly any need of sharing. If I wanted to share my InterpretBank glossary at all, I would export it and send it via email or copy it into a cloud-based team glossary, so that my colleagues can use it at their convenience. The terminology in InterpretBank is divided into glossaries and subglossaries. Technically, everything is stored in one single database, “glossary” and “subglossary” just being data fields containing a topic classification and sub-classification. Importing only works glossary by glossary, i.e. I can’t import my own (quite big) database as a whole, converting the topic classification data fields into glossaries and sub-glossaries. After having imported an existing glossary, I now create a new one from scratch (about cars). In edit mode, with the display set to two languages only, InterpretBank will look up translations in online translation memories for you. All you have to do is press F1 or using the right mouse button or, if you prefer, the search is done automatically upon pressing the tab key, i.e. jumping from one language field to the next –empty– one. When I tried “Pleuelstange” (German for connecting rod), no Spanish translation could be found. But upon my second try, “Kotflügel” (German for mudguard), the Spanish “guardabarros” was found in MEDIAWIKI. By pressing F2, or right-click on the term you want a translation for, you can also search your pre-selected online resources for translations and definitions. If, however, all your language fields are filled and you only want to double-check or think that what is in your glossary isn’t correct, the program will tell you that nothing is missing and therefore no online search can be made. Looking up terminology in several online sources in one go is something many a tool has tried to make possible. My favourite so far being http://sb.qtrans.de, I must say that I quite like the way InterpretBank displays the online search results. It will open one (not ten or twenty) browser tabs where you can select the different sources to see the search results. The functions for collecting reference texts on specific topics and extracting relevant terminology haven’t yet been integrated into InterpretBank (but, as Claudio assured me, will be in the autumn). However, the functions are already available in a separate tool named TranslatorBank (so far for German, English, French and Italian). While searching in „normal“ edit mode is accent and case sensitive, in conference mode (headset icon) it is intuitive and hardly demands any attention. The incremental search function will narrow down the hit list with every additional letter you type. And there are many option to customize the behaviour of the search function. 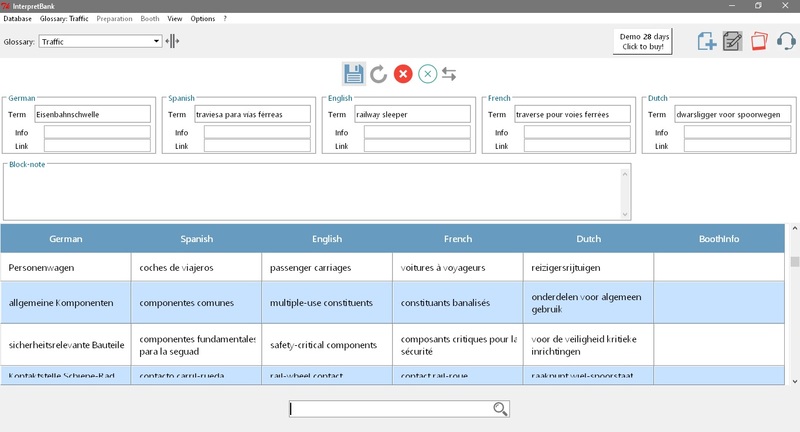 Actually, the „search parameters panel“ says it all: Would you like to search in all languages or just your main language? Hit enter or not to start your query? If not, how many seconds would you like the system to wait until it starts a fresh query? Ignore accents or not? Correct typos? Search in all glossaries if nothing can be found in the current one? Most probably very useful in the booth. When toying around with the search function, I didn’t find my typos corrected, at least not that I was aware of. When typing „gardient“ I would have thought that the system corrected it into „gradient“, which it didn’t. However, when I typed „blok“, the system deleted the last letter and returned all the terms containing „block“. Very helpful indeed. In order to figure out how the system automatically referred to IATE when no results were found in my own database, I entered „Bruttoinlandsprodukt“ (gross domestic product in German). Firstly, the system froze (in shock? ), but then the IATE search result appeared in four of my five languages in the list, as Dutch isn’t supported and would have to be bought separately. At least I suppose it was the IATE result, as the source wasn’t indicated anywhere and it just looked like a normal glossary entry. Queries in different web sources hitting F2 also works in booth mode, just as described above for edit mode. The automatic translation (F1) only works in a two-language display, which in turn can only be set in edit mode. The memorizing function, in my view, hasn’t changed too much, which is good because I like it the way it was before. The only change I have noticed is that it will now let you memorize terms in all your languages and doesn’t only work with language pairs. I like it! All in all, in my view InterpretBank remains number one in sophistication among the terminology tools made for (and mostly by) conference interpreters. None of the other tools I am aware of covers such a wide range of an interpreter’s workflow. I would actually not call it a terminology management tool, but a conference preparation tool. The changes aren’t as drastic as I would have expected after reading the announcement, which isn’t necessarily a bad thing, the old InterpretBank not having been completely user-unfriendly in the first place. But the user interface has indeed become more intuitive and I found my way around more easily. The new online look-up elements are very relevant, and they work swiftly. Handling more than two languages has become easier, so as long as you don’t want to work with more than five languages in total, you should be fine. If it weren’t for the flexibility of a generic database like MS Access and the many additional data fields I have grown very fond of , like client, date and name of the conference, degree of importance, I would seriously consider becoming an InterpretBank user. But then even if one prefers keeping one’s master terminology database in a different format, thanks to the export function InterpretBank could still be used for conference preparation and booth work „only“. Finally, whatwith online team glossaries becoming common practice, I hope to see a browser-based InterpretBank 5 in the future! PS: One detail worth mentioning is the log file InterpretBank saves for you if you tell it to. Here you can see all the changes and queries made, which I find a nice thing not only for research purposes, but also to do a personal follow-up after a conference (or before the next conference of the same kind) and see which were the terms that kept my mind busy. Used properly, this log file could serve to close the circle of knowledge management.